GOVERNMENT: Independence from Great Britain, 1966. Parliamentary constitutional monarchy. Prime minister elected by universal suffrage. Governing bodies: two-house parliament. 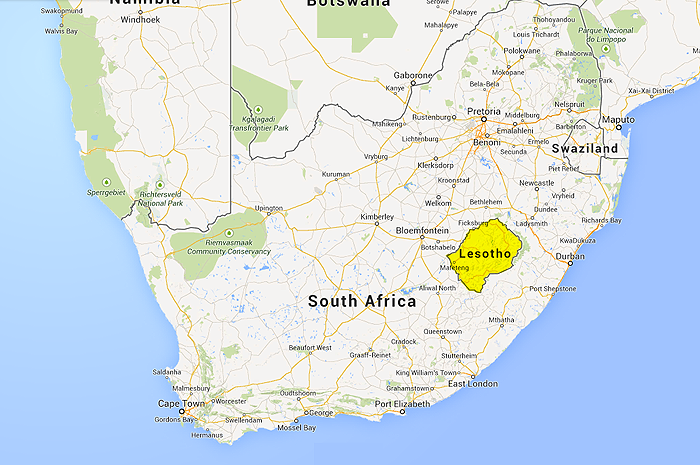 A small, mountainous country in southern Africa, the Kingdom of Lesotho is completely surrounded by SOUTH AFRICA. Before gaining independence in 1966, Lesotho was a British protectorate known as Basutoland. Today it is dependent on South Africa economically and for access to the outside world. Lesotho is located in the Drakensberg Mountains at the edge of the southern African plateau. The western part of the country contains a narrow strip of lowlands ranging in elevation from 5,000 to 6,000 feet. The eastern highlands, crossed by a number of rivers, contain peaks of more than 11,000 feet. The climate is generally moderate, with average temperatures between 45°F and 70°F and a rainy season from October to April. Severe droughts occur occasionally. In prehistoric times Lesotho was inhabited by KHOISAN hunter-gatherers. From about the 1500s BANTU PEOPLES began migrating into the area and settled among the Khoisan groups. In the early 1800s, a leader named MOSHOESHOE I united some 22 separate clans under his authority. When the area was invaded by other groups, including the ZULU, Moshoeshoe successfully repelled them. His followers became known as the Basotho, and their homeland was called Basutoland. In 1834 a new threat emerged. White settlers of Dutch ancestry, called Afrikaners, began migrating northward from Cape Colony in South Africa and seized land belonging to the Basotho. The Basotho fought the Afrikaners for decades. The conflict intensified in 1854 when the Afrikaners established a new colony, the Orange Free State, west of Basutoland. The Basotho sought protection from the British, who annexed Basutoland as part of Cape Colony in 1871. Twelve years later Basutoland became a protectorate under British colonial authority. The Basotho chiefs were allowed to continue enforcing traditional laws. Between the late 1800s and mid-1900s, Basutoland moved slowly toward self-government, which it achieved in 1965. The following year the country gained full independence as the Kingdom of Lesotho. A constitutional monarchy, Lesotho has a king who serves as head of state, an elected assembly, and a prime minister who leads the government. Since independence, rivalries within Lesotho have caused political instability. In 1966 the king, Moshoeshoe II, demanded greater power and Prime Minister Leabua Jonathan placed him under temporary house arrest. Four years later, when Jonathan faced defeat in the national elections, he declared a state of emergency, suspended the constitution, arrested opposition leaders, and sent the king into exile. Jonathan held power as a dictator until 1986, when he was overthrown by the military under General Justin Lekhanya. Lekhanya installed a military dictatorship in Lesotho, but by 1990 he faced political unrest. In an effort to win support for his government, he put Moshoeshoe II back on the throne—with limited powers. However, when Moshoeshoe opposed some of Lekhanya’s policies, the king was replaced by his son, Letsie III. The following year, Lekhanya was overthrown. The new head of government, General Elias Ramaema, agreed to hold elections in 1993. This resulted in the restoration of democracy under Prime Minister Ntsu Mokhehle. However many junior army officers opposed the new government, and fighting soon broke out within the army. During one of the struggles, the deputy prime minister was killed. King Letsie III stepped down in 1995 to allow his father to return as king, but Moshoeshoe II died the following year in an automobile accident. Letsie once again took the throne. Following the election of Pakalitha Mosisili as prime minister in 1998, a wave of protests swept through Lesotho. Fearing an insurrection, the government asked South Africa and BOTSWANA for assistance. Many businesses and government offices were looted and destroyed in rioting before troops of soldiers were able to restore order. Lesotho is a poor country with few natural resources. Although the economy is based primarily on farming and raising livestock, only about 10 percent of the land is suitable for agriculture. The main crops are corn, sorghum, wheat, and beans. Unable to produce enough to support the population, Lesotho imports about 25 percent of its food. Lesotho’s few industries export items such as clothing, pottery, and leather goods. Tourism, especially from South Africa, has been increasing in recent years because of the country’s scenic beauty. Poverty, unemployment, and the lack of natural resources have made Lesotho economically dependent on South Africa. For decades, tens of thousands of workers have migrated from Lesotho to South Africa to work in industries such as mining. However, in the late 1980s South Africa began to restrict the number of foreign workers in the country, which has left many people in Lesotho unemployed. Almost all the people in Lesotho are Basotho. Most are Christian, though about 20 percent practice traditional religions. Despite the country’s great poverty, about 70 percent of the population is literate. Both English and Sesotho, the Basotho language, are spoken.